Hello! Today I have another Christmassy mani to share with you. I recently purchased both Uberchic Beauty Christmas plates 01 and 02 from Nail Artisan, and I love them! One of the first images to catch my eye was the little gingerbread men on plate 01. I've seen plenty of manis created with it already, but I just couldn't resist doing my own. Read on for more info! I started off with a base of Leighton Denny 'Raspberry Affair*' (*spelt 'Afair' on my bottle), a rich deep purple creme. This was a freebie with Elle magazine a few weeks ago, and was my favourite out of the four available colours. It is smooth and easy to apply, but does apply a bit patchy at first. I was a bit too heavy handed on my second coat, so needed a quick third. Below is three coats without topcoat. 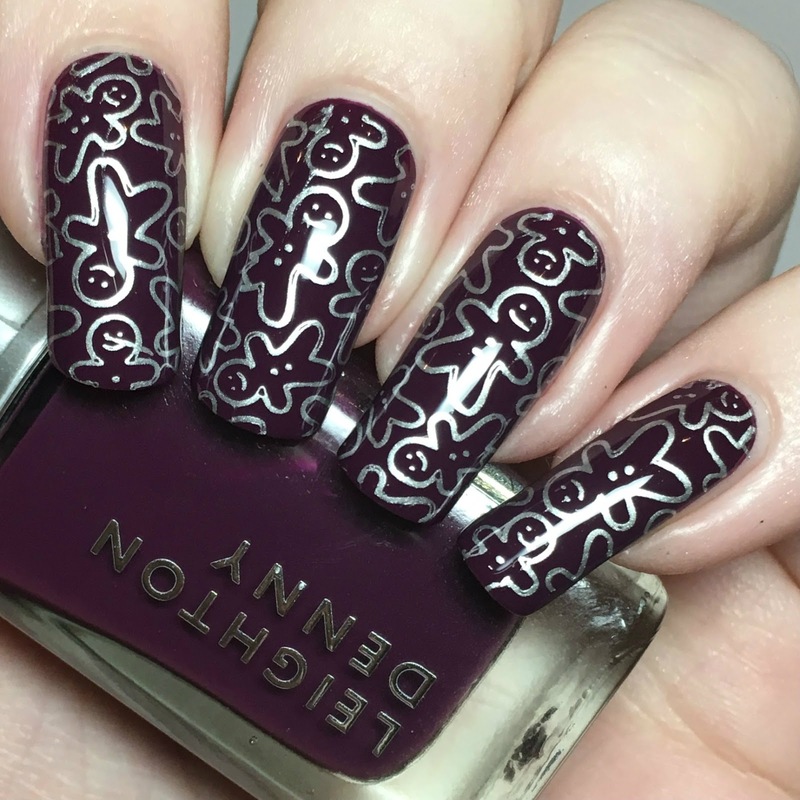 To stamp the gingerbread men I used Uberchic Beauty plate Christmas-01 stamping plate, my Born Pretty Store clear stamper and Barry M 'Silver Foil'. The pattern picked up and transferred so easily each time, and left me with a lovely crisp image. I finished by topcoating to seal everything in. What do you think? I love them! There's nothing cuter than gingerbread men! I also really like the combination of colours together. The bright silver foil really pops off of the darker base. I can't wait play more with the Uberchic Christmas plates, if only December was longer so I could use every image! Stunning swatch and ginger bread image perfectly match with the base. Adorable mani. wow. That color is so amazing. Love this & it's great you find a plate big enough for your nails. I struggle with mine and they're half the size of yours. Love that base colour too, it's stunning. The base is amazing (I may have LOL's at the spelling of it on your bottle!). And I'm such a fan of metallic stamping - so these are just too cute! OMG your nails are perfect! OMG!!! This color combo is just perfect!!! I have this exact plate some maybe I can give something similar a try! Oh me squeeeee those gingerbread are super cute! I like how they look like they are bouncing around! Too cute. I love that gingerbread man. Elle would be fun to buy if they had prizes in the US with them. I've been eyeing this image on my stamping plate, and I'm so glad to see it in use! That base is so rich and amazing! I love that you used unconventional colors for this. It's playful and elegant all at the same time. 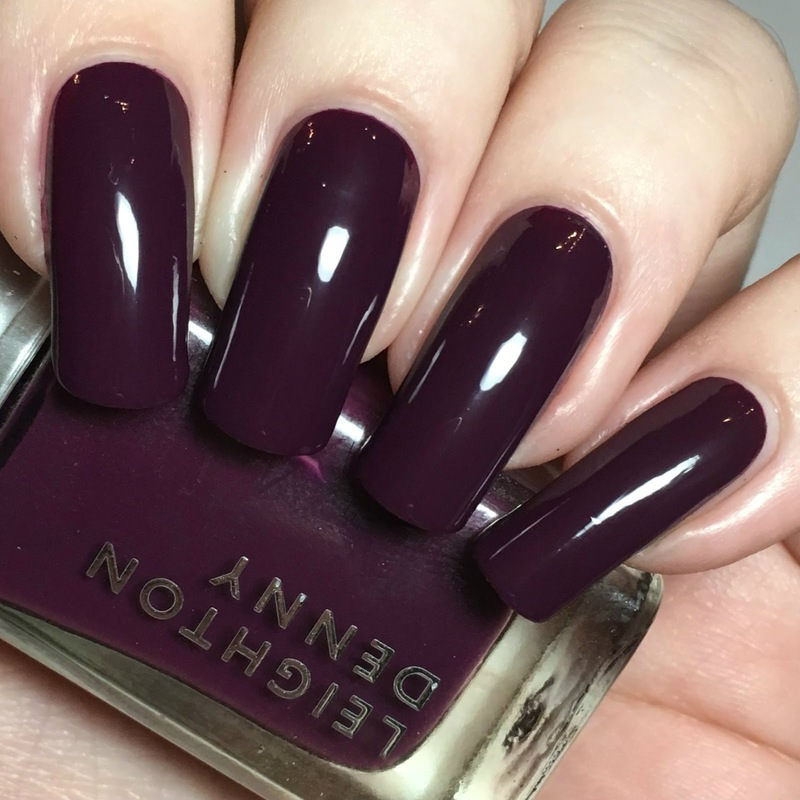 O-M-G that base shade Leighton Denny 'Raspberry Affair is absolutely STUNNING! I love the festive gingerbread stamping too. So perfect for this time of the year. Love the little gingerbread men!!! I love the stamping! So vibrant and crisp. Very beautiful mani. I loved how crisp you stamped it. 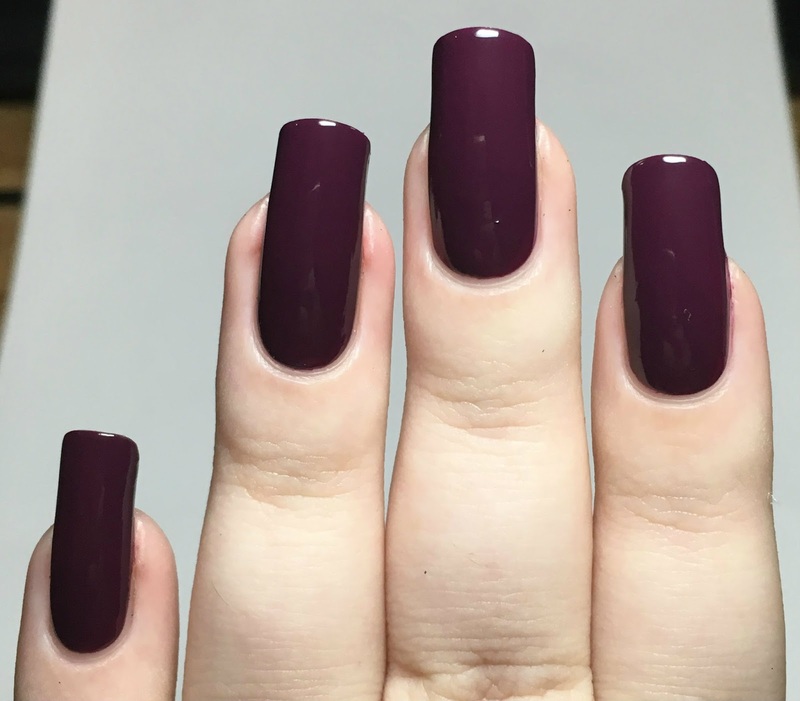 I love that plum! The stamping really makes it. 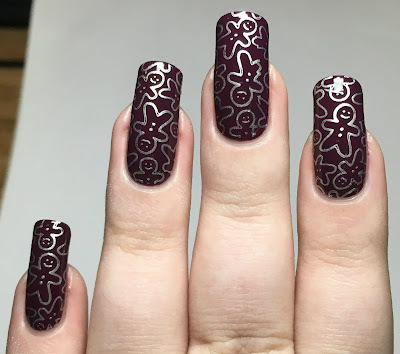 i keep seeing manis with this stamping design and i really love it!